4/18/2019 4:48:36 PM - Jon Gordon is a master. His compositions, improvisation, tone, and technical virtuosity set him apart as an elite musician of our time. “The most beautiful thing we can experience is the mysterious. It is the source of all true art and all science. He to whom this emotion is a stranger, who can no longer pause to wonder and stand rapt in awe, is as good as dead: his eyes are closed.”(Albert Einstein). to experience the unknown as he delivers a masterful performance on his latest release. Gordon is a native New-Yorker who has played with a multitude of jazz giants including Maria Schneider, Clark Terry, Benny Carter, Phil Woods, T.S. instrument), that it could be hard to retain the listener’s attention; however, this is not the case. The artistic collaboration among these musicians is astonishing. Take for instance the composition “Visit,” featuring Gordon on saxophone, Monder on guitar, and Drummond on drums. Monder begins the song with luscious, volume swelling chord voicings, with Drummond playing time softly on his cymbal. Gordon soon comes in with the melody in what proves to be a mesmerizing composition. The music is as full and rich as possible. 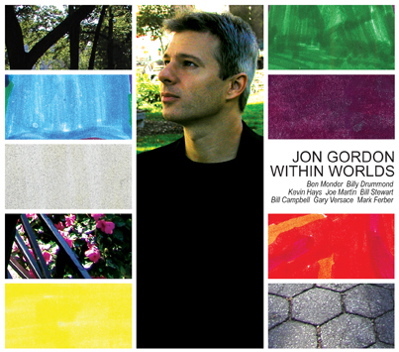 Gordon’s solo is deeply imaginative, creating a place of mediation for the listener. On the track Sicily Gordon joins organist Gary Versace and drummer Mark Ferber in another astounding performance. The groove and passion played by these three will make it hard for the listener to sit still. Their solos are stunning and very passionate. One of the highlights on the recording is the title track “Within Worlds.” Gordon teams up with Ben Monder, Kevin Hayes, Joe Martin, and Bill Stewart on this track. The saxophone, guitar, and piano collectively take active roles in stating the melody. The harmonies and use of space are highly creative. Gordon, playing soprano saxophone on this track, delivers another incredible solo. One can only marvel in listening to his beautiful tone and lyricism. Hayes piano solo ‘sings’ and sounds compellingly ethereal. Monder, arguably one of the greatest guitar ists of all-time, follows Hayes solo. His improvisation demonstrates the kind of musical maturity that can only be created by true masters. The musicians on Within Worlds are as good as they get, taking risks and playing very adventurous, succeeding one-hundred percent of the time. The only slight draw back is the recording quality, is reminiscent of some of the live Miles Davis Plugged Nickel records. However, as is the case on those albums, this music is too good for that to be a factor. "Jon is one of the greatest alto players ever"
"Gordon has embraced the history of his instrument, carrying with it the ability to extend music as a universal language"
"Not only a great soloist, but also possesses a gorgeous tone."